This blog post is a first in a series of guest posts we are rolling out. The auther, Jesse Stoller, hails from northwest Indiana where his family farms. He is the owner of Ag Data Partners which developed out of his homegrown passion for farm finance and data analysis. When playing with building blocks as a child, many of us recognized the importance of building a structure in the right way and order. If we tried to build our creation on our bed, the structure would soon topple over due to a lack of a stable foundation. With only a slight movement, the mattress would shift and bring the walls tumbling down. It was obvious that we couldn’t build the second level until the first was complete or the roof before the walls. These were just rules of building that we couldn’t usurp or shortcut. A simple concept that seems to escape some people is the fact that successful businesses do not just happen; they are built just like our toy building block creations. Just like our childhood building projects, the inherent rules still apply. Business building takes time and needs to be done in the correct order. The first level cannot be built until the foundation is complete and strong enough to withstand the weight and stress of the structure and environment. In production agriculture, the need for a strong foundation is the same, and at times, even more important than some other industries. Farmers are trying to thrive in a very volatile, uncertain, and ever-changing environment. The emotional strain this can bring to a farmer is tremendous and will most likely effect the decisions made on the farm. This is why having a foundation anchored by numbers is so critical. 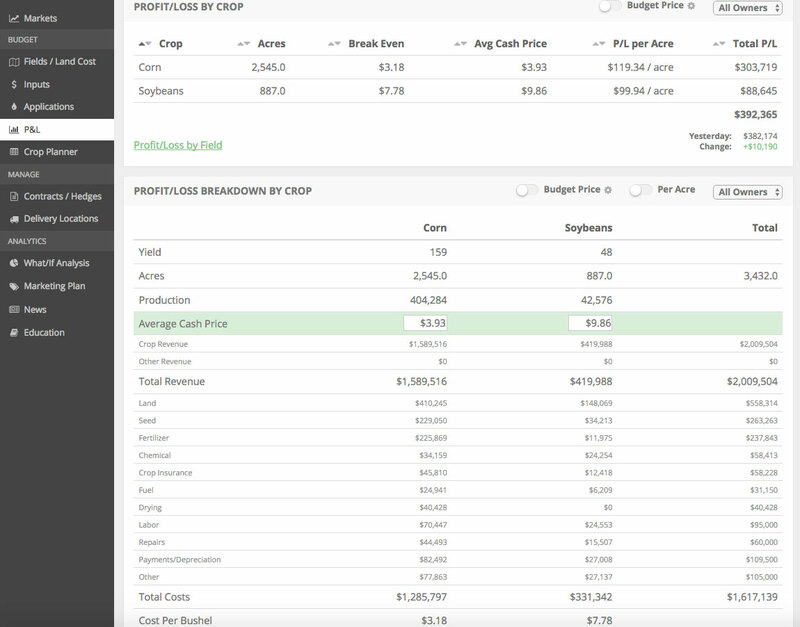 There have been many impressive and powerful tools developed recently for crop producers to track their profitability and input ROI by sub-acre levels. The issue that many growers are realizing is that these tools are extremely difficult to implement because of the inherent challenges of data collection and management. We need to focus and simplify our efforts to foundational levels first before attempting to implement higher level tools such as these. There is also a wide array of companies that boast their products as being the cutting edge in the industry. These also are poor investments if a solid business foundation has not been established. The foundation needs to be laid first before moving to the next level. The key component to a strong foundation is knowing your numbers. Some of the most successful farmers may even tell you that they have gotten to the point when they needed to know their numbers in order to sleep at night. Every farm needs to know their breakeven levels, return on management practices, individual field accrual performance, cash flow, and P&L’s. These are critical components to any business’s foundation. So let’s look into the individual fundamental components that makes up a strong farm foundation. The first that we need to cover is the exercise of researching different markets and deciding which you would like to target. For example, if there is a production facility nearby that produces non-GMO corn chips, there may be a significant opportunity for you to capitalize on this specialty crop option. The same goes for many other market opportunities that sometimes get overlooked by the majority of producers. It is very important to know the market and the environment in which you are running your business. Another key component of the farm foundation is understanding your costs of production which gives you an understanding of your break-evens and margins. Without this understanding, how does a grower know how to formulate an effective marketing plan, land rental proposal, or financial projection for obtaining financing? You can’t. It’s just simply not possible. Some may say that these things are obvious, which they are. The problem isn’t that they are not obvious, it’s that this takes focus and a lot of work and time. These are commodities that today’s farmers are generally short of, due to the complexity of their operating environment. This is where farm management software can be extremely beneficial and profitable to a farming operation. Not only do these farm management software tools provide an intuitive platform with which a farmer can input operating information, but it also provides the organization needed to provide excellent accountability and structure. Also, given the importance of this foundational set of tasks, if there is a need for physical assistance in these areas there are helpful options in the industry for business consulting. If needed, it’s well worth the investment. One foundational piece of this pie is the quantification and validation of decisions made on the farm. Impacts of decisions on the farm are extremely difficult to quantify given the vast range of variables that come into play. Since it is arguably impossible to guarantee complete accuracy of decision results, the only way to get as accurate as possible is to continually record our activities and the impacts associated with these decisions and activities. By increasing the sample size in this manner, we can start to accurately trend results to see some valuable insights that will help us with future decision making. One way we can obtain these kinds of results is by tracking profitability by field or management practice, such as planting date or tillage program. After having these insights to work with, a farmer will not be able to operate without them. They become necessities to the operation. Financial statements such as cash flows, P&L’s, balance sheet, and income statements are all parts of this durable foundation. Not only records, but projections. It is necessary to show accurate projections to the bank in order to obtain financing. It is also important to show them how you came to those numbers. This is when having a detailed projected operating plan complete with field-level, accrual P&L’s is extremely beneficial and important for the future of a farming operation. Other critical, foundational components in farming are people, processes, legal matters, and communication practices, but I won’t dig into those right now. My focus is on the numbers. I want to make sure that farmers have a clear understanding of the makeup of a strong foundation so that when the storms come, their farming operations will stand strong and remain financially healthy and viable for the future. Jesse is the owner of Ag Data Partners, LLC, an Indiana-based provider of ag data management and consulting services. Jesse has first-hand farm management experience with his involvement in his family's north-western Indiana farming operation."